You are here: Home / cake cake cake / Baked Cookies ‘N Cream Chocolate Donuts. 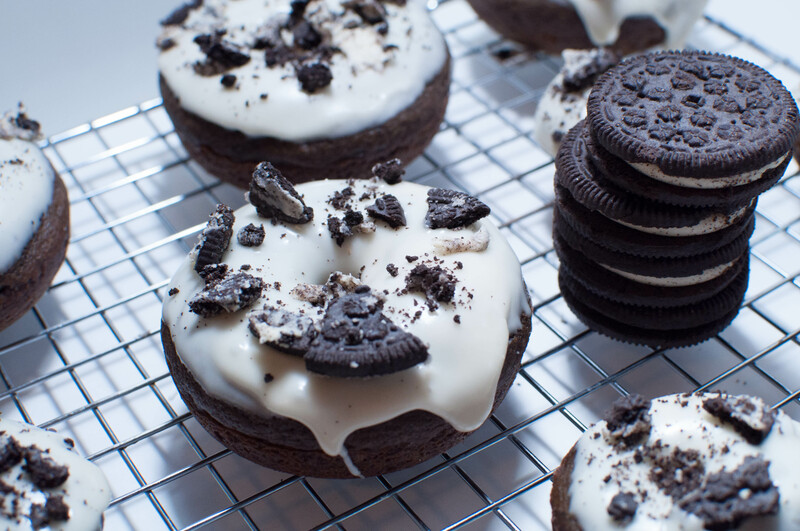 Baked Cookies ‘N Cream Chocolate Donuts. Real talk of the day: I’m not a big fan of Oreos. And oddly enough, I don’t recall ever eating them all that often when I was a kid. Now, before you write me off as crazy, let me be specific: I don’t hate Oreos or anything. I mean, they never did anything to me [except they kind of leave a stain on my teeth/around my mouth after I eat them]. But I’ve just never understood what all the fuss is about. Despite the fact that I’m not exactly wowed by Oreos, I get the occasional strangely fierce craving for anything related to that “cookies ‘n cream” combination. I don’t know why; I guess I’m just a weirdo. But honestly, what’s not to like about the quintessential cookies ‘n cream combination? 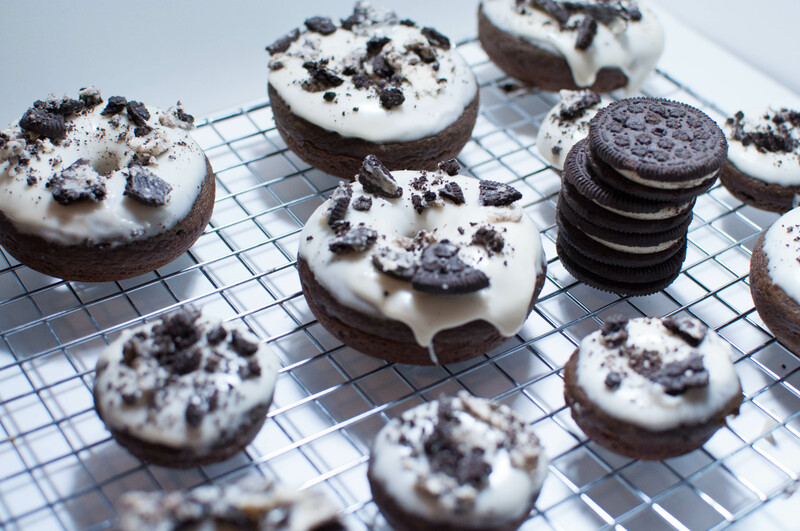 It’s a pretty glorious combo, even if you – like me – don’t necessarily love Oreos. 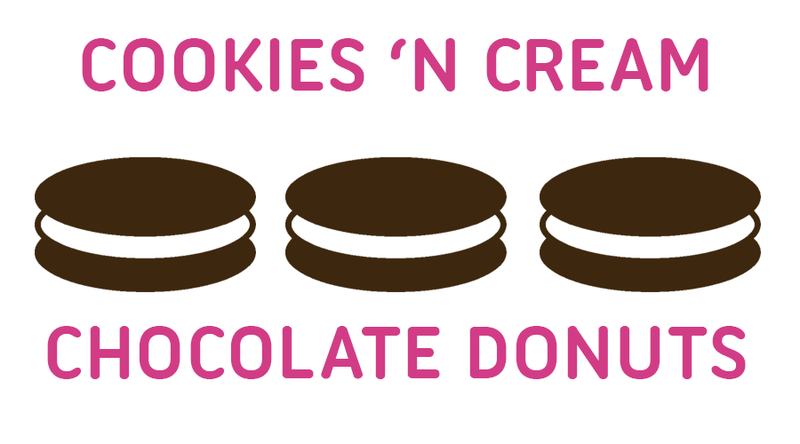 Baked donuts are just so fun to begin with, and these donuts are rich and chocolatey, so that makes them exponentially more awesome. 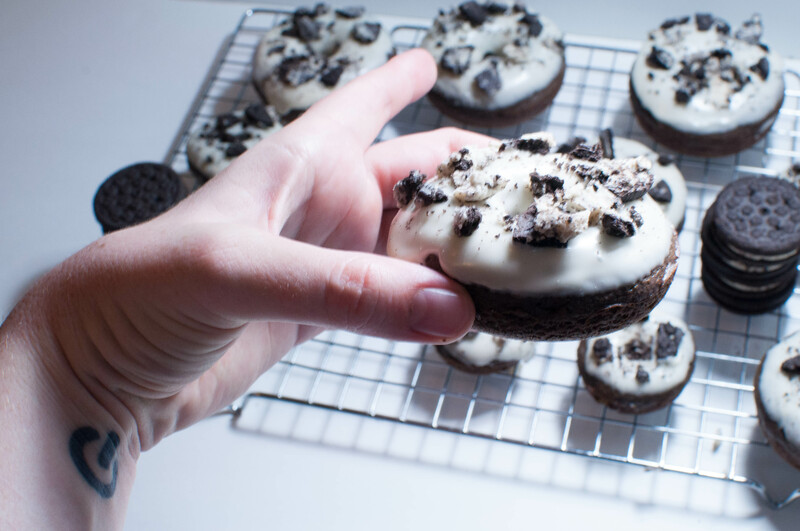 The icing is thick and sweet, and it pairs well with the donuts for that awesome cookies ‘n cream taste combination. The crushed cookies on top just take these donuts to the next level of awesomeness. 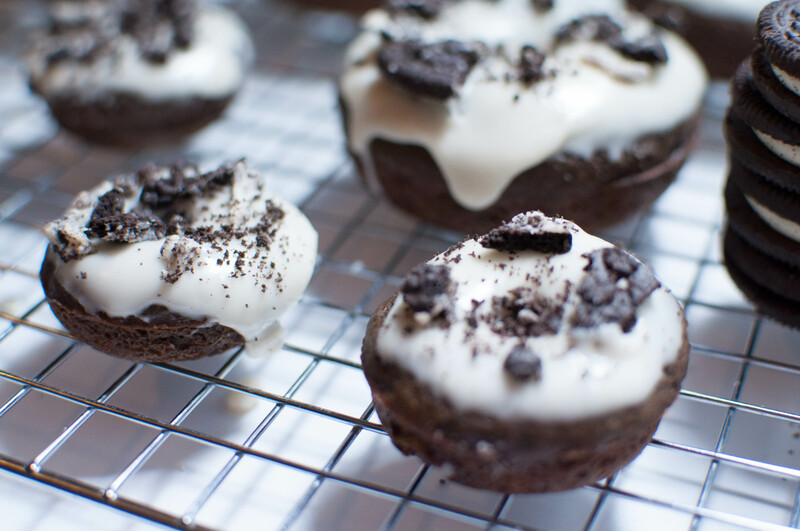 So if you’ve got a donut pan, you need to make these as soon as humanly possible. And if you don’t have a donut pan, get yourself one so you can make baked donuts! Yield: The original recipe says twelve donuts, but I got more than that. I did regular-sized donuts and miniature donuts. Maybe my regular donut pans have smaller cavities? I’m not sure if the pans are universally sized. 2. Whisk together the dry ingredients in a large bowl (cocoa powder, flour, sugar, baking powder, baking soda, and salt). Mix together the wet ingredients (eggs, milk, vanilla, vinegar, and butter) in a medium bowl. Add the wet ingredients to the dry, and stir until combined. 3. Put the batter into a piping bag [or a Ziplock bag with the corner cut off] and pipe it into the donut cavities, filling them about 3/4ths of the way full. Gently tap the pan on the counter to get the batter to settle a bit. 4. Bake the donuts for 12 to 15 minutes, or until a toothpick inserted into the center comes out clean. Allow the donuts to cool for several minutes, then pop them out of the pan to cool on a rack. 1. Add the powdered sugar, milk, and vanilla in a medium bowl and whisk until combined. The icing will be very thick – this is okay. Dip the tops of the donuts into the icing, or spread a thick layer on them. 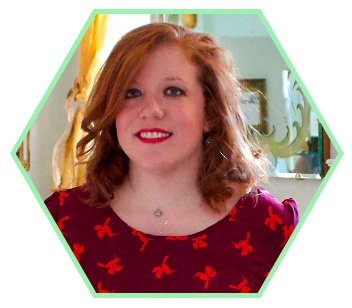 Recipe from Tessa at Handle the Heat.